There's a joke format going around twitter about 5 year plans. I've always been a short term planner/fly by the flaming seat of your pants type... Life always seems to fit the John Lennon line about plans so living as much in the moment as possible seems to make sense. Plus, ADD and a general inability to keep track of stuff tends to get in the way too. But if we want to buy this land (which we've learned won't be available for sale until December) we need a plan. A real plan. Not a grand dream... But something doable. Something we can not only accomplish but which gives those from whom we hope to seek help an understanding we don't want a handout to buy the place so we can then sit on our collective asses. The house is situated on the back third of the property. 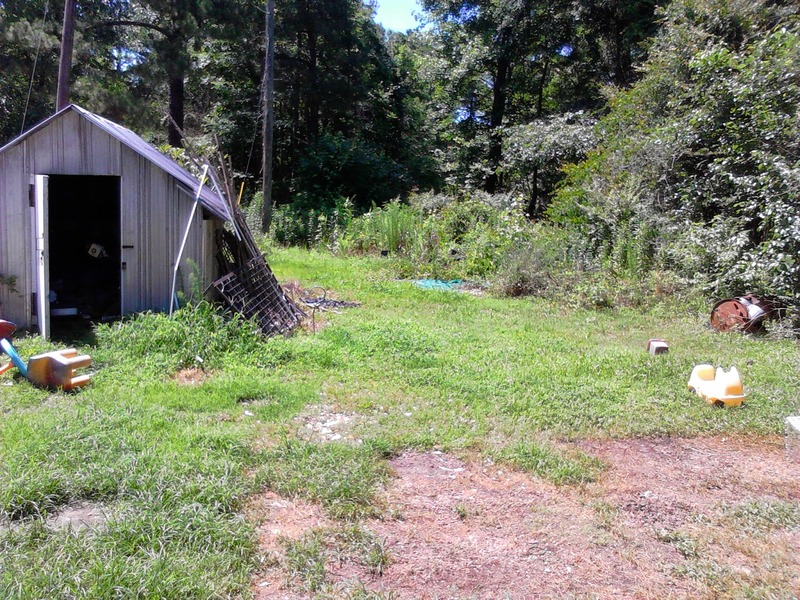 The area behind the shed in the picture is out of control Chinese privet, mulberry and muscadine grapes. Beyond that, between the grove of pine and maple is the marsh/sometimes pond. Last year I had grand plans to bank the pond (preventing the wet season river in our front yard), dig it deeper, get rid of the overgrowth and cultivate the grapes and older mulberries. We cleared it... ish and even managed a raised bed vegetable garden in a dozen of the hundreds of old tires littering the place. But then Charlie got sick and nearly died and by the time he came home, I didn't have the will to fight the land. I've done some research and learned a pair of goats can clear pretty much everything we need cleared, if we take the step to protect what we want to keep. Their droppings will help fertilize the land and if we build a movable enclosure, in 5 years time, we'd have everything we want cleared. Adding more chickens and building a coop/run with handles on one side and wheels on the other would give us a rotating garden. Set the coop in the fall and by spring, 10 hens will completely clear, till, fertilize, and rid the ground of most pests. Move the coop to an adjacent location and they'll not only clear another space, I'll have a handy place to toss most garden weeds, which would supplement the chickens diet. We have a shed once used for detailing cars where we can store pallets we'll collect over the course of the next year (and beyond). Those pallets would be used to build shelter for livestock, the chicken coop (we have wheelbarrow tires already) and movable pasture enclosures. As the goats clear land, we can choose to add landscape plants, garden features, pea gravel paths or permanent pens for a small dairy cow and an alpaca. Aside from new nails and screws, most of the hardware such as hinges, locks, etc... is already here. Part of Daddy's collection of "stuff". For the house, there are repairs to make and an extension we'd like to add. The extension would make use of the one garage/shed on the property with both a strong foundation and solid frame. It's a big enough area for 2 studio apartments if we wanted to do that but we need only 1 more bedroom, a handicap accessible bathroom and larger kitchen space. Extending the house to that shed would be perfect. We'd connect using a wide hallway ramp rather than stairs and that end of the house would be Charlie and my bedroom, bath and hobby areas... Allowing us to renovate the front of the house for Dan and John, whose 5 year plan includes living at home, working, going to school and helping us get a small homestead/sustainable farm off the ground. The front of the property has room for two small cottages or trailers which go a bit beyond the 5 year plan but would provide a place for friends or kids to visit or live as life may need. Fact is, both boys plan to stay local as they have their sights set on working for a local aerospace company. Their desire to stick close to family is both their safety net and, I'm certain, a genetic trait from generations of clan life in the Tennessee foothills. Also, they like living where they can shoot a gun, a bow and arrows , or "try science" without scaring the neighbors. Looking at the reality of things, Charlie's health isn't great but he does continue to improve. If he has a place to comfortably sit, he can do any number of things to build, repair or design whatever we may need. He can still do home maintenance... His only real limitation is electrical or magnetic fields... But, that chainmail I've been working on? THAT is a functional Faraday cage which would protect him so he can pass on his electrical and welding expertise to the guys and me. Using scrap metal and welding to sculpt and create functional or fun art is part of my lifelong plan. As for income, I'm presently working on the back shed to create a workspace for the items I'd like to make for sale. It's also a great space for cleaning and fixing up various vintage items littering the property and hundreds of old bottles we can sell online or at flea market. Charlie, Dan and John are working part-time for Jesse (Becka's fiance) and their Amazon store. It's not bringing in huge amounts but it's helping and getting better with each month. There's also the matter of scrap which can still be hauled off and sold. We have a trailer needing minor repairs. That and a hitch for the jeep are all that's needed to enable us to get the tons of scrap out of the way and add to the home reno fund. We can already live off our present income. If we take a few steps to de-clutter and simplify, we can stretch that further. Chickens, dairy animals and gardens would, in the long run, cut back on our food bills. Learning the art of preserving fresh foods would go even further to cutting our current expenses. An alpaca, while not a need, is an animal ideal to the area, less expensive to feed and care for than sheep, and a twice yearly shearing wouldn't cost us. Around here, the people with the skill to shear an alpaca do it for a portion of the fleece. As I don't yet have the set up to process and use alpaca fleece, the rest of it can be sold... If we buy a well-bred female, she can be bred, opening the door for a small measure of profitability rather than cost. And that comprises most of our 5 year plan. Some areas need greater thought and detail. I need to work to strengthen myself and restore my endurance to be a farmer... But there's little wrong with me that rehab exercises and time outside at work won't help. It's a doable plan. It's not an unreasonable dream. It's also a plan that would give us greater self-reliance and stability for the future. It seems like a lot yet seems like so little. But it's a plan we can break down into manageable parts... And, for me, that's a big deal and an even bigger step. Because "Plans? We don't need no stinking plans!" isn't a realistic life motto. P.S. If you want to help, here's the link to our Go Fund Me page.